The durability and the resulting freshness of the product are of course the main topic in the vacuum packaging area. 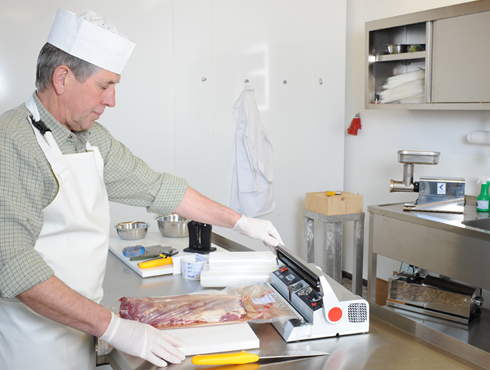 Due to the extremely high vacuum Lava Vacuum Sealer guarantee a particularly long shelf life. Below is the shelf life of foods without and with Lava vacuum packing, both at room temperature, stored in a refrigerator and storage in the freezer. Please read the processing tips mentioned below, when using your vacuum sealer, these points provide interesting information for Vacuum packaging and hygiene. If you have further questions about vacuum and hygiene, don't hestitate to contact us. Note: The indicated period is dependent on many factors (see also below, processing and hygiene tips) and therefore not binding. Vacuum meat always cooled (about 0 to +3 ° C), for a better quality of the product. Also, the maturation process in the vacuum bag is much better. The product, which should be vacuumed, must always be fresh. Already stored products have a much higher bacterial count. The hands must be washed thoroughly during the processing and packaging. To insert the product into the bag, llatex gloves are recommended. A work surface made of stone or stainless steel is recommended, as this can be cleaned easily without leaving residue. The surface and all working tools such as knives, saws, axes, etc. have to be cleaned carefully during portioning to package. A storage in a closed cold chain is essential for meat. Mixtures between raw and cooked products during vacuum packaging should be avoided. It could be still mentioned so much more in this area. The above seven points, however, are among the most important factors for an optimal and hygienic vacuum packaging. Generally stated: A low initial bacterial content of the product takes a long shelf life. A high initial bacterial content can spoil the goods faster.